Combination locks are popularly considered to be the most secure option. A combination lock basically consists of sequences of numbers and symbols that are used to open the lock. People have turned to them as a more convenient option, compared to the traditional key-based locks. They come in different shapes and sizes and have wide applications. You can also decide on the number of dials you want, so as to not complicate the combination for you. User friendliness: the lock should not give you a hard time when it comes to setting and re-setting your combination. Purpose: You need to consider what you will use the lock for. This will help you determine the size and even getting a TSA approved one, in case you plan to travel. Construction: you need to ensure that you choose a padlock, which can handle the purpose you choose it for. This will help determine whether you will need, weather resistant or abuse capable locks as well. BV combination locks are widely acknowledged since they are also TSA approved. If case you are the kind of person who is always traveling this will definitely come in handy. The TSA won’t need to break or force your lock open. They can easily unlock and re-lock it without any hassle. The main advantage is that, you don’t have to keep stressing over your keys. Say goodbye to those dreaded days, where you kept losing your keys or forgetting them behind. The combinations on this lock are so simple to set, you will feel relieved. This purchase will get you two very secure locks that have wide applications. You can use them for your School Gym Locker, Luggage Suitcase Baggage Locks, Filing Cabinets, Toolbox and even Cases. It is a great fit with luggage brands such as Samsonite, Eagle Creek, American Tourister, Tumi, Rockland and skyway, just to mention a few. 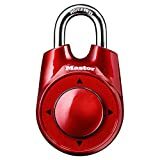 The combination lock is also available in red and silver as well. The dimensions of the entire padlock; (L,H,W): 1.18 in x 3.94 in x 0.47 in (3 cm x 10 cm x 1.2 cm). You will get a 3 years replacement warranty. This is not your ordinary combination lock. You will instead get to use word combinations instead of numbers. How unique is this! It’s a fun change of pace. However, the fact that it is different doesn’t make it any less secure. The lock has a 5 dial combination and will prove even easier for you to remember. Each dial has ten letters, making the possible letter combinations to be approximately 100,000. The combination has a cast metal body and a shackle made from hardened steel. When you also take its heavy duty locking mechanism in to consideration, you can be sure that it can withstand severe abuse. If you have never been good with numbers, how about you give this option a try. They can be used for both personal and commercial purposes as well. The word lock technology is patented. It is a maximum security lock. 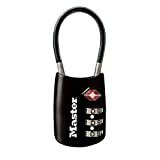 Master lock presents you, a first of its kind design. This combination lock is a patented 1500iD Speed Dial. It uses directional movements to open. What this means is that, you’ll have to move it right, left, up and down, in order to unlock it. This is another interesting choice to go for, if you like things that standout. No more struggling with small numbers under low light. Anti-shim locking technology was used in its construction. This is one other feature that sets it apart from traditional combination locks. The technology used, makes it even more secure than its counterparts. You are free to use any number of movements, in whatever sequence you want. The combination lock’s design is durable. The padlock is recommended for indoor usage. For a weather proof combination lock, Desired Tools has just the thing. It has been constructed using zinc alloy and plated steel, for that purpose. You don’t have to worry, incase the combination gets compromised or you forget it. The lock has been design with the simplest way to set or re-set combinations. Not only that, but the customer support provided is great. So, you will never really get stranded, since they are always there to help. 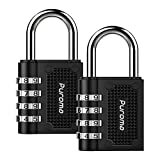 The combination lock is 3.25″ x 1.7″ x 0.7″ in size and weighs about 5 oz. You will get a 3 year warranty. As far as TSA approved locks go, this is another great choice. The combination lock has been designed with a metal body to make it more durable. The shackle is made from flexible braided steel, covered in vinyl. This is what makes it resistant from baggage handling equipment abuse. This particular padlock has 3 dials for setting your combination. 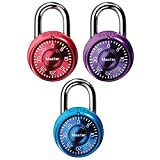 The small lock is available in 3 other colors. It has a red-and-white Travel Sentry™ logo. 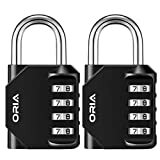 ORIA has one of the most appealing combination locks in this review today. It has a surface made of baking vanish, which gives it that polished look. If padlocks could be elegant, this one would definitely make the cut. Zinc alloy was also used to make it strong and sturdy. Your belongings are definitely in great hands. So whether you need to travel or even lock your bicycle, this mini padlock will not let you down. It comes with a 12-Month Replacement Warranty. You will get a 60-Day Money Back Guarantee. KeeKit offers a combination lock which you can freely use outdoors. This padlock can be used for locking your gate or even outdoor storage facility. Don’t let its compact size fool you, using it will lead to some peaceful nights for you. The lock is resistant to rust and can withstand all weather elements. The best thing about it is that, the numbers have been made easy to read. Your purchase will get you a pair of combination locks. It is a 4 digit combination lock. This purchase will get you 3 mini combination locks. They have been brightly made in order to make them easier to identify. They were constructed using metal and have a cover made of anodized aluminum. The shackle is made of steel and measures 3/4 in. the length and 13/16 in. width. If you buy this set, the same combination will be able to open all three of them. The lock is resistant to cutting and sawing. This purchase will get you 2 combination locks. Puroma offers you value for money, considering the quality of the locks. You can get them in; whole black, blue sideline, red sideline, and black & code window. They are a good fit for someone looking for one they can use for light duty. Your purchase will get you a one year warranty. You can either be refunded or get a replacement under this. You’ll get over 10,000combination code possibilities. If you ask any previous buyer, they would definitely buy these locks if they could do it over again. That is how good they are! Their design speaks volumes about these combination locks. They have a small volume and are very light. Combining these and other features makes it easy for the locks to fit through a variety of suitcase holes. They can be used in and outdoors. They come in a pack of two. 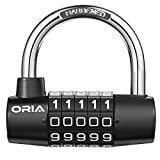 The ORIA Combination Lock, 4 Digit Combination, is our preferred option. Our decision was largely based on user feedback and it exceptional construction. It was a close call since the last combination locks were basically neck to neck. 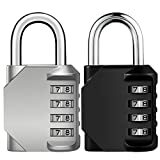 The top 10 best combination locks in 2019 are honestly the finest in the market. Grab one today, and feel at ease whenever you have valuables to protect.